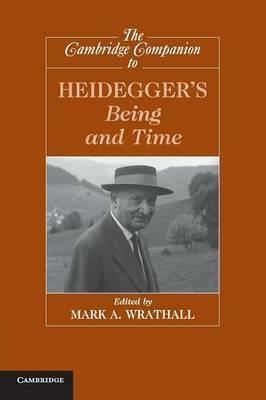 The Cambridge Companion to Heidegger's 'Being and Time' contains seventeen chapters by leading scholars of Heidegger. It is a useful reference work for beginning students, but also explores the central themes of Being and Time with a depth that will be of interest to scholars. The Companion begins with a section-by-section overview of Being and Time and a chapter reviewing the genesis of this seminal work. The final chapter situates Being and Time in the context of Heidegger's later work. The remaining chapters examine the core issues of Being and Time, including the question of being, the phenomenology of space, the nature of human being (our relation to others, the importance of moods, the nature of human understanding, language), Heidegger's views on idealism and realism and his position on skepticism and truth, Heidegger's account of authenticity (with a focus on his views on freedom, being toward death, and resoluteness) and the nature of temporality and human historicality. 1. An overview of Being and Time Mark A. Wrathall and Max Murphey; 2. Martin Heidegger's Being and Time: a carefully planned accident? Alfred Denker; 3. The question of being Taylor Carman; 4. The semantics of dasein and the modality of Being and Time Wayne Martin; 5. Heidegger on space and spatiality David R. Cerbone; 6. Being-with-others Hubert L. Dreyfus; 7. Why mood matters Matthew Ratcliffe; 8. Heidegger on human understanding Mark A. Wrathall; 9. Heidegger's pragmatic-existential theory of language and assertion Barbara Fultner; 10. The empire of signs: Heidegger's critique of idealism in Being and Time Peter E. Gordon; 11. Heidegger on scepticism, truth and falsehood Denis McManus; 12. Death and demise in Being and Time Iain Thomson; 13. Freedom and the choice to choose oneself in Being and Time Beatrice Han-Pile; 14. Authenticity and resoluteness William Blattner; 15. Temporality as the ontological sense of care Stephan Kaufer; 16. Historical finitude Joseph K. Schear; 17. What if Heidegger were a phenomenologist? Thomas Sheehan. 'The Cambridge Companion to Heidegger's 'Being and Time' is a welcome addition to the growing body of literature that treats Heidegger as a philosopher with whom it is possible to argue. The essays provide a wonderful introduction to central issues in Heidegger's magnum opus, each making a substantial philosophical contribution of its own.' Steven Crowell, Rice University 'This collection is a thorough, wide-ranging, and rigorous survey of the current state of play in Anglo-American Heidegger scholarship, and a sustained argumentative contribution to its advancement.' Stephen Mulhall, University of Oxford '... this book is a quality contribution to commentaries on Martin Heidegger's Being and Time ... The essays are uniformly careful and clear, providing a rich explanation of the complexities of Heidegger's work and the varying interpretation of it ... Recommended. Lower-level undergraduates through researchers/faculty.' Choice "The Cambridge Companion to Heidegger's 'Being and Time' is a welcome addition to the growing body of literature that treats Heidegger as a philosopher with whom it is possible to argue. The essays provide a wonderful introduction to central issues in Heidegger's magnum opus, each making a substantial philosophical contribution of its own." Steven Crowell, Rice University "This collection is a thorough, wide-ranging, and rigorous survey of the current state of play in Anglo-American Heidegger scholarship, and a sustained argumentative contribution to its advancement." Stephen Mulhall, New College, Oxford University "... this book is a quality contribution to commentaries on Martin Heidegger's Being and Time ... The essays are uniformly careful and clear, providing a rich explanation of the complexities of Heidegger's work and the varying interpretation of it ... Recommended. Lower-level undergraduates through researchers/faculty." Dr Mark A. Wrathall is Professor of Philosophy at the University of California, Riverside. He is the author of Heidegger and Unconcealment (Cambridge, 2010) and How to Read Heidegger (2006). He has edited a number of collections, including A Companion to Heidegger (2007), A Companion to Phenomenology and Existentialism (2009), Religion after Metaphysics (2004) and Appropriating Heidegger (2008). Dr Wrathall has contributed chapters to The Cambridge Companion to Heidegger (2006) and The Cambridge Companion to Merleau-Ponty (2004), as well as numerous articles to peer-reviewed journals in philosophy. He has lectured at universities in Germany, China, Japan, Taiwan, the United Kingdom, Sweden and Finland.